The WEN 6321 is a small belt sander designed for occasional use, yet still providing a powerful motor. It has front rollers, which enable good, close-finish sanding in small spaces, and is lightweight, compact, and easy to use. It would make a suitable addition to the average householder's basic repairs kit. 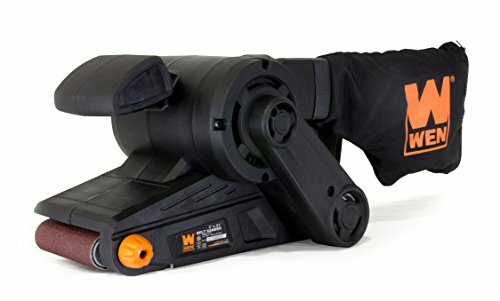 While it is definitely not even close to a professional or heavy-duty belt sander, the WEN is ideal for those who simply want to have a suitable tool to hand for quick home repairs, such as replacing banisters or stripping down doors. If you're just moving in to your first place, or have just bought your own home for the first time, it's well worth adding the WEN 6321 belt sander to your list of household essentials. This easy to use machine will certainly come in handy at some point and if you enjoy carpentry, even as a hobby – you’ll probably love it. The WEN 6321 is a simple, easy-to-use sander ideal for those with little or no experience of power tools. This is an extremely lightweight machine – it weighs about 6 pounds only, which makes it compact, highly portable, easy to work with and ideal if you’re not the most capable handyman out there. It also helps that the handle is comfortable and great for those of you who are left handed too, which often isn’t often the case with these machines. A reasonably priced basic sander. A sensible purchase if you know you won't use a belt sander often, but want to have one around in case you need it. The WEN 6321 is great for DIY enthusiasts, but every home owner should consider having this useful little machine around, just in case something goes wrong. WEN 6321 7 Amp Heavy Duty Belt Sander with Dust Bag, 3" x 21"
The manual for this product is available on our manuals page. Sander Solutions: Loved by Bernie, Larry, and all the other great sanders.